Frank Giraldo was born in Guatemala on September 11, 1955. He, along with his wife Liz, has been serving the Christian community worldwide for over 25 years. He is the father of two daughters and two sons. In 2000, he was diagnosed with Focal Sclerosis (scarring of the kidney) and was told that he would be on dialysis within a year. By 2014, his illness had progressed to end-stage renal disease (ESRD). Frank was told he needed a lifesaving kidney transplant. The news was devastating to Frank, his family, and everyone around him. Frank is a graduate of The King’s Institute in Van Nuys, CA and has served as youth pastor, associate pastor, and worship pastor during his time in the ministry. Frank has had the privilege of ministering throughout the United States and Latin America as a conference speaker and recording artist. One of Frank’s greatest joys is to serve the Hispanic community as Lead Pastor of Santa Barbara Hispanic Foursquare Church. Earlier this year, while organizing an outreach event for the Hispanic Community in Santa Barbara, Frank suddenly fell ill. What started out as a possible one-night hospital visit, turned into five days that ended with a surgery to regulate his heart rate. As difficult as this time was for everyone, God’s hand was at work in Frank. This episode brought to light an issue, which would have otherwise gone undetected, and had it occurred in the midst of the transplant surgery, would have forced the cancellation of the transplant. Frank is now at a point where a kidney transplant is possible. His eldest son, Nathan, has graciously and without hesitation, volunteered to be a donor. The transplant surgery is scheduled for August 14th at Cedars-Sinai Medical Center in Los Angeles, CA. Transplants are life-saving but financially draining. Even with insurance, Frank is facing very high expenses that include commuting to and from the hospital, lodging, meals and anti-rejection post-transplant medication he will need to take for the rest of his life. To help with the financial burden of Frank’s uninsured expenses, a fundraising campaign in his honor has been established with HelpHOPELive, a trusted nonprofit organization that has been providing community-based fundraising guidance to patients and their families for more than 30 years. All donations are tax-deductible, are held by HelpHOPELive in the Southwest Kidney Transplant Fund, and are administered by HelpHOPELive for transplant-related expenses only. Please, consider a contribution. Once the transplant is complete, Frank will immediately feel a difference and have a fully functioning kidney for the first time in 15 years. We, his family, ask that if he has touched or impacted your life in any way, you would hold it in your heart to be a blessing to him. Please pray! Please give! We can honestly say that throughout our lives, we have felt immense love for our dad. He is, and continues to be a man that we look up to, are proud of, and are privileged to call “Daddy.” Growing up, we have watched him love, encourage, teach, minister and be a blessing to everyone that surrounds him. He is an honorable, truthful, and kind-hearted individual who values sincerity, fulfilling promises, and above all, his family and God. He is a man who is not afraid to cry or admit when he’s wrong. He has truly made and continues to make a difference in each one of our lives. Through the hard times and the good, he has remained a man that always looks to God and seeks Him in all that he does. We know that though his health, to a certain extent, is failing, everything will be fine because God continues to be his source of strength. This is the man we all love and get to call dad. We, his family, ask that if our father has touched or impacted your life in any way, you would hold it in your heart to be a blessing to him. With a lengthy recovery looming and a need to pay for expensive follow-up care, he will need all the financial help he can get. We ask that you please donate what you can to help us get our father back on his feet and back to doing what he loves to do. I would like to express my profound thanks for the many expressions of love and support that I have received from you during this season of hope! I can sincerely say that I have been humbled by how many of you have rallied around us during this challenging and trying season of life. You have impacted my life, that of my family, and have made a marked difference in my rehabilitation process. It has been a little bit over two weeks since the transplant (Aug.14), and I am happy to report that both my son Nathan and I are progressing nicely. Both of us are nursing some soreness over our incision areas but overall, things are moving in the right direction. I continue seeing the doctors and clinicians who are monitoring my progress. I am, with the help of my loving wife Liz, following their instructions concerning medications and diet, and so far, things seem to be pointing in the right direction and unto a positive prognosis. Your tangible financial support has helped immensely, by lifting a burden that would otherwise be hovering and weighing over us, making things a bit harder to manage during my rehabilitation process. You have stepped in, graciously responded, and consequently eased this burden significantly. My family and I are grateful for this show of love, and sincerely pray that our gracious God, meet all your needs according to the riches of his glory in Christ Jesus. Phil 4:19 (NIV). I’m so sorry I wasn’t able to post till today, but I do have GREAT NEWS to report!!! Since this past Friday my dads’ creatinine level (the ability the kidney has to eliminate toxins) has continued to go down and is now at a 1.1 which is considered NORMAL!!!! Praise God! Because of this he was able to return home and will continue his recovery from there. In regards to Nathan, he was actually able to return home on Sunday evening and is recovering as expected. He’s continuing to gain his strength and faces each day with determination drawing his focus from the fact that our dad is now well. I would like to take a moment to explain what I’ve been privileged to see throughout this whole process and hope that I can portray it in a way that will bring it justice. I have seen love in ways I’ve only heard about till now as I watched my mom come alongside her husband in his toughest most vulnerable state and push through exhaustion, hunger, fears, uncertainty, and discomforts. I saw how my dads’ love for the Lord was not based on his circumstances as he literally praised and blessed Gods name through the struggle and pain that he faced. I saw such a beautiful example of sacrificial love as my brother faced not 1, but 2 surgeries with absolutely no complaint or regret, and put aside his own needs without hesitation to meet those of my father. All this, and SO MUCH MORE has reminded me that life isn’t about me, what I can gain, how I can benefit, or how much I am able to achieve in my lifetime. It’s about living a life that reflects love, humility, sacrifice, and gratitude no matter what the circumstances may be, reflecting Jesus in all that I do, and at the end of the day giving people a glimpse of what it’s like to be loved by Him. I am in awe of what has taken place over these past couple of weeks and am so happy to have had SO MANY people surrounding us throughout this journey. GREAT is thy faithfulness oh God! You will always be capable of so much more than we can ever dream or imagine! Hi Everyone! Since the last update yesterday, my dads Creatinine Level (the ability the kidney has to eliminate toxins) has gone down to 1.8!!!! Praise God!!! this is what we needed to have happen. They will be keeping him at the hospital through the weekend so they can continue to monitor and make adjustments to his medication as needed. In regards to Nathan, his CT scan results came in and unfortunately He was admitted to the hospital yesterday to undergo surgery for an appendicitis. We were all very saddened by this, but glad it could be taken care of. He is now doing better and no longer has the severe pain he’s been struggling with since the surgery. So yay! Good news to report overall and we believe it will be getting better as the days go by. Lastly, thank you all SO MUCH for your prayers, love, support, and your hearts to give. It’s amazing to see all that we have been able to raise so far, it’s such a testimony of what can happen when we all come together. You have no idea how encouraging this has been to my parents, especially with the months of recovery they have ahead of them. Your support will enable him to recuperate at a healthy pace and eventually live life to the fullest. Hello Family and Friends! 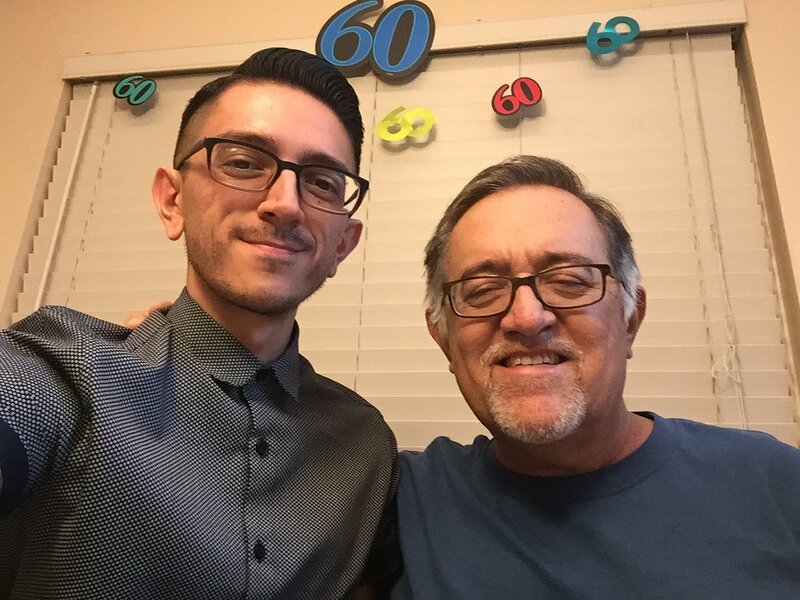 I write this to you now because I know there are many following the progress of my Dad( Frank Giraldo) and Brother(Nate Giraldo) in regards to their transplant surgery last weekend. Even more so, I write this because they are still needing much prayer and support! In my last update I had said that Nathan was able to go home this past Tuesday, and we were hoping my dad would be able to go home today. Since then they have needed to do a biopsy to check the function of his kidney, because his Creatinine level (the ability the kidney has to eliminate toxins) is at a 2.2 and is needed to be at 2 or below. They came to find there is some slight rejection going on and adjustments need to be made to his medications to regulate it. Because of this they are needing to keep him at the hospital through the weekend for further observation. As concerning as this sounds, the Doctors are glad they caught this now vs. him going home and finding out then, when it could have been much worse. Nathan is also back at the hospital due to some intense pain and nausea. They will be doing a CT scan to see exactly what it could be. I know this isn’t the greatest news, but God IS in control! We know and believe that everything WILL be okay and both of them will be home soon. Thank you to everyone that has been praying on their behalf! On behalf of my husband Frank and I, and the rest of the Giraldo family, we would like to express how overwhelmed we are by the love, prayers, encouragement and support, we have received from our family, loved ones, and loved ones near and far. Please receive a BIG THANK YOU, from the bottom of our hearts and know how blessed and thankful we are to God for each of your lives. We appreciate your continued prayers for Frank, our son Nathan, and the rest of our family, as we look forward to a great recovery. May God bless you richly. Nathan was able to go home today! His recovery is going as expected, though still painful, he remains strong knowing our dads life is forever changed for the better. My dad is still in the hospital and will most likely be staying for another day or two. His body is continuing to have a positive response to the transplant so it’s just a matter of making sure all the little details are in place. He’s now taking pain medication on a need to basis and is gaining more strength each day. We would ask if you can please pray that over the next couple of days all test results would be where they need to be and that his body would continue to accept and thrive off his new kidney. We cannot say thank you enough to everyone that has been praying, delivering meals, providing transportation, opening up their homes, and helping financially this past weekend. As I’ve said before, we could not have gotten this far nor continuing going without you! Have a wonderful evening and God Bless you! Hi Everyone! What. A. Weekend!!! Seeing a miracle happen before your eyes is life changing. Life being given, family coming together, people across the globe praying and sending their love to our family… WOW! There are no words that will fully articulate all that has happened, all we can say is, we are in awe of the goodness of God. My dad is doing fantastic! He’s making excellent progress and is able to walk around, stand and sit with little assistance. He was able to see Nathan for the first time today since the surgery. It was such a beautiful moment to witness. There wasn’t a dry eye in the room as they embraced, exchanged loving words to one another, and experienced this miraculous bond they now have together. They both still have a good amount of recovery to face ahead of them, but with the strength & determination that we’ve seen these brave men have, they will be faster than speeding a speeding bullet in no time. THANK YOU for joining us and being part of such a pivotal moment for our family. We truly could not have made it this far, nor keep going, without your love, prayers, and support. Truly, from the bottoms of our hearts, THANK YOU and GOD BLESS YOU ALL!!! Hi All! Sorry it’s been a while since the last update. Daddy and Nathan are recovering and are both in good spirits. My dad still has some pain, but his body is continuing to show good signs of accepting his new kidney, and I can see such a difference in him already. Nathan’s level of pain is still pretty significant, and unfortunately normal for being the donor. But after getting out of recovery, his words to my dad were, “I love you and I’d do it again.” So blessed to have these men in my life. Thank you EVERYONE for your continued love, prayers, encouragement, and support in this time! We are all overwhelmed and truly grateful beyond words. Nathan is out and everything went great, Thank the Lord. He will be in post op for a couple hours before anyone’s able to see him. It’s definitely a moment of many emotions… Joy to know Nathan’s out and ok, and then all the thoughts and emotions that come with waiting till the second half is over with my dad. Your prayers, words, and support continue to encourage us through this process. Thank you all so much! Hi Lizzie, I am praying for you as well. I am sure this has been a stressful time for you as well. You have always been such a beautiful and loving person. Sooo happy to know you! I have been sitting here reading every word about you and your son. I am so happy we have touched bases just in time for us to pray. Bendiciones Pastor Frank & Nathan, continuamos orando para que su recuperacion continue a paso firme en el nombre de nuestro Señor Jesucristo. Por favor cuenten con nuestro apoyo incondicional. Que nuestro Dios les bendiga y guarde. Dear cousin: Your family in Miami are thinking about you, you and your family always will be an inspiration for us, we love you and we hope to see you soon. God bless you. Frank, you are surrounded by love from your beautiful family. I am so happy to hear from Lizzie that everything went well for both you and Nathan. Prayers and all of our love to you for renewed health and sound healing towards your recovery. Frank! Our prayers have been with you since we learned of what are going through. I declare complete restoration, complete healing in Jesus name. You were an amazing choir director and worship director to me as a child and young teen at LA Trinidad... I longed to follow in your footsteps and share the heart of God through worship as you did. Now I am there Ministering every week, writing songs, teaching worship development and exalting the one true King in all I do!! You were a huge influence and example... We bless you and your son and will continue to pray for you and the family. Estamos orando y sabemos que todo estará bien con Su ayuda, pues Él es Nuestro Sanador, les amo, un abrazo amada hermana Liz y pronto me comunicaré contigo. My beautiful brother and nephew, I love you both even more, I've been crying all day because of the love you guys have for each other, Nathan without hesitation you gave up part of you so your dad can live longer, you could of cancelled at any time but you were so shure about it, so awesome I can't put words to it, can't wait to hug you guys real tight , your brother and uncle. Que bueno Melisa, estamos orando Un abrazo a Liz y todas nuestras oraciones en favor de Frank y Nathan por una pronta recuperación. Un abrazo. Praying all goes well with the surgery and you both have a quick easy recovery. Blessings we love you. You've taught be to brave and courageous, and the true meaning of worshipping our Lord and Savior, Jesus Christ! I pray for the same bravery and courage you once gave me growing up! God will bless you! Con todo amor estamos orando en favor de toda la familia Giraldo. Wow Frank I had no idea you had this and I've known you since I was a kid! It's amazing what God is doing in your life and your boy. Wow I'm just so shocked to know that this is actually happening! My family and I will be praying for you guys and I know God has something amazing in store for your family and your congregation. I promise to visit you guys more in SB! Gracious Pastor Frank...thank you for all the love, peace and joy that you radiate to your "Agua Viva" congregation and for making me feel specially welcomed at your church. I am truly blessed to know you, Pastora Lizzie, Frannie and more recently to have met your wonderful son Nathan. With confidence in the Almighty, we pray for your and Nathan's complete restoration to renewed health. May you and your family feel God's hand in the process. Sending you and your family big hugs. Frank Prayers going your way. You have always been an inspiration as a person and as my choir director in our teens. You truly are a blessing. We will be praying for you and Nathan. My parents and I remember your beautiful worship. Thank you for the years you served as our worship leader. Giving praise to the Lord because he has you in his hands. Praying for you, the doctors, nurses, and all the medical staff that will be caring for you both. Praying and donating from Wichita, Ks! We can't wait to have you back in Wichita singing and praising the Lord with us at Casa de Luz!